Home / Blog / Why is kombucha good for you? 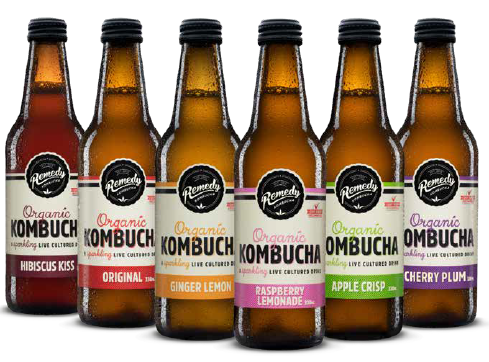 When kombucha is fermented naturally and kept raw, unpasteurised and unfiltered, like they do at Remedy, it contains healthy, living, good bacteria, or live cultures. Every bottle of Remedy Kombucha contains literally billions of these microorganisms. Live cultures are great for gut health. We now know, thanks to the amazing work of scientists around the world, that good gut health is super critical to overall health and wellbeing. Research has proven (and continues to explore in more detail) how it affects everything from our digestion to our mood. Live cultures improve gut health because they increase the diversity of your gut flora, or gut microbiota, aka the microorganisms or bugs that live in your gut. They work together as a symbiotic community to get things working as they should and can also prevent the opportunistic growth of bag bugs. So the more diversity in there, the better things will work! The live cultures also supply vitamins, minerals and fibre, which the healthy bacteria in your gut use as a food source to produce important metabolites. Organic acids, also known as short chain fatty acids (SFCA) are produced during the natural fermentation or brewing process of making kombucha. You probably aren’t prepared for the words “acid” or “fatty” to be good, but trust us these little treasures are a powerhouse of goodness with proven health benefits. Prevent overgrowth of bad pathogenic bacteria. Provide an energy source for the good bacteria in your gut. Help stabilise blood sugar levels. Remedy Kombucha is teeming with naturally occurring polyphenols – nutrients which are rich in antioxidants to help the body fight illness and slow down the ageing process. These polyphenols – which come from the organic green and black tea that form the base of our brew – also play an important role as a prebiotic to increase the ratio of beneficial bacteria in your gut. In addition to the good stuff that IS in Remedy Kombucha, the other benefit comes from what’s NOT in it, and that’s sugar! The negative health effects of too much sugar are pretty clear; from really basic and fairly immediate affects like skin breakouts, mental fog causing weight gain, through to major risks such as diabetes, heart disease. The beauty of Remedy is that although sugar goes into the initial brew, it gets eaten up by the live cultures during fermentation to produce those amazing organic acids we keep raving about. Remedy brews out ALL of the sugar, and we test every batch to make sure. Which is why we have the official tick of approval from the gurus themselves, Sarah Wilson and her team at I Quit Sugar.